Angry Birds has been a huge success story of the modern mobile platform, and the franchise has branched out considerably since starting out as a simple game for iOS. As I write this, I am surrounded by several Angry Birds plush toys, but products have ranged from phone cases, to speaker docks, to books. The natural progression would probably be a movie, but with that particular venture scheduled to be happening in years to come, fans will have to make do with a new Web cartoon series, which premieres on March 16th and 17th. 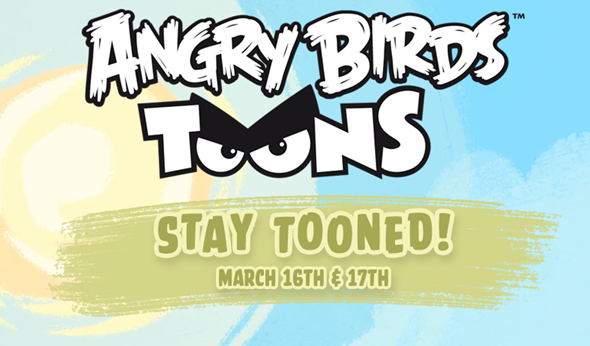 A teaser clip of Angry Birds Toons, which plays over the original Angry Birds theme tune, has just been released, and looks as though it will be loosely based on the plot of the game. The whimsical birds chuckle and cackle their way through the 45 second clip, and as per the game itself, it’s hard not to pay attention. Such is the Digital World we live in nowadays, that games are being popularized quickly, and instead of games being based on movies – as has tended to be the case in recent years – the movies and cartoons are being based on the titles. When Rovio Entertainment announced the aforementioned movie for 2016, it seemed a long way away considering the popularity of the franchise in general could decrease or lose out to a newer, even more rampant phenomenon. But by introducing this Web series, consumers will likely be getting a taster of the sort of shape the eventual movie will take, and I can’t help but think that the eventual motion picture will benefit massively from three dimensions over at the IMAX. So, if you are indeed an Angry Birds fan, brace yourself for yet more adventures with those annoying, yet still somewhat loveable little birds. The series will begin in a couple of weeks’ time, but we’ll be sure to remind you guys when it does finally hit the Web.